Saint John’s Church, Monkstown, County Cork (in the Church of Ireland Parish of Carrigaline Union) overlooks Cork Harbour. It has a spectacular vista of Great Island (where Cobh, known as Queenstown in 1915 and central to the responses to the sinking of RMS Lusitania), and a view also of the comings and goings today to and from the Port of Cork. The National Maritime College of Ireland (NMCI) is also situated in the parish and the rector, the Reverend Elaine Murray, is Church of Ireland Chaplain. 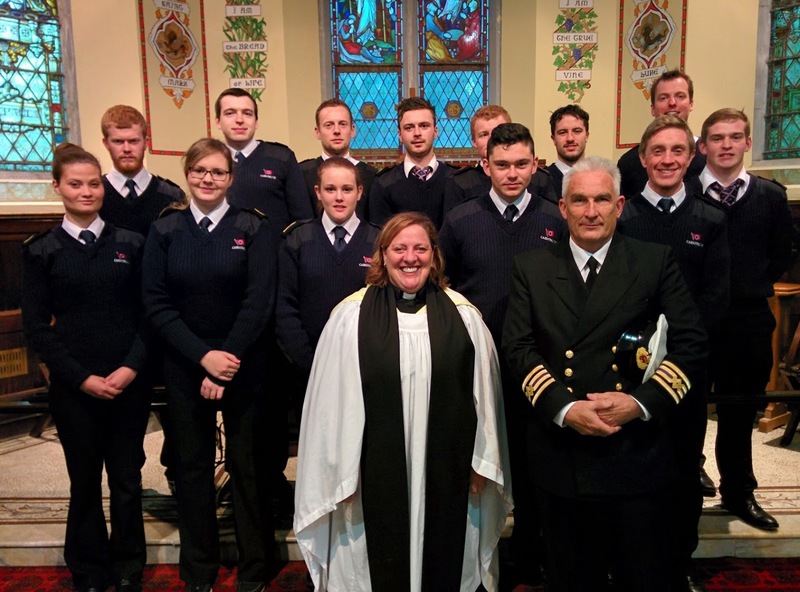 The Reverend Elaine Murray (centre), Rector of Carrigaline Union and Church of Ireland Chaplain to the National Maritime College of Ireland, with Officers and Cadets who attended the RMS Lusitania centenary commemoration in St John’s Church, Monkstown, County Cork. It was appropriate, therefore, that Officers and Cadets of the NMCI attended a poignant Choral Evensong in St John’s Church on Sunday 10th May 2015 to mark the centenary of the sinking, on 7th May 1915, of RMS Lusitania. Gerard Horan of NMCI spoke very movingly of what is known about the lives of some of the survivors of the sinking. Meanwhile on 7th May in the Parish of St Luke, Douglas, Cork, schoolchildren from St Luke’s National School visited the Church on the centenary itself to see the memorial to a former parishioner Sir Hugh Lane, who died when RMS Lusitania was sunk. Hugh Lane was an Irish art collector who founded the Dublin Municipal Gallery of Modern Art (the first known gallery of modern art in the world). Commemorations were held in many of the affected coastal towns, villages and parishes of the United Dioceses of Cork, Cloyne and Ross. An oar washed ashore from one of the lifeboats of RMS Lusitania hangs in the Church of St Barrahane, Castletownshend, County Cork. This entry was posted in Centenary, Church in Society, Church Services, Community Involvement, Decade of Centenaries, Diocese, Parish News. Bookmark the permalink.